This shows the vinyl cutter station (Station #3), which features the Graphtec CE6000-60 24” vinyl cutter/plotter and a desktop all-in-one computer. Even though the vinyl cutter only needs the computer to operate, when considering the set-up of this station in the Library Innovation Studio project, the library will need to also allow space for the two Epson WF 3260 printers that is described in the Heat Press Station, Station #3. That is because the computer that is connected to the vinyl cutter is the same computer that is connected to both the printer using sublimation ink and the printer using pigment ink. Each of the four devices will need to be plugged into electricity. The computer will need internet access, ideally through a hard-wired port. 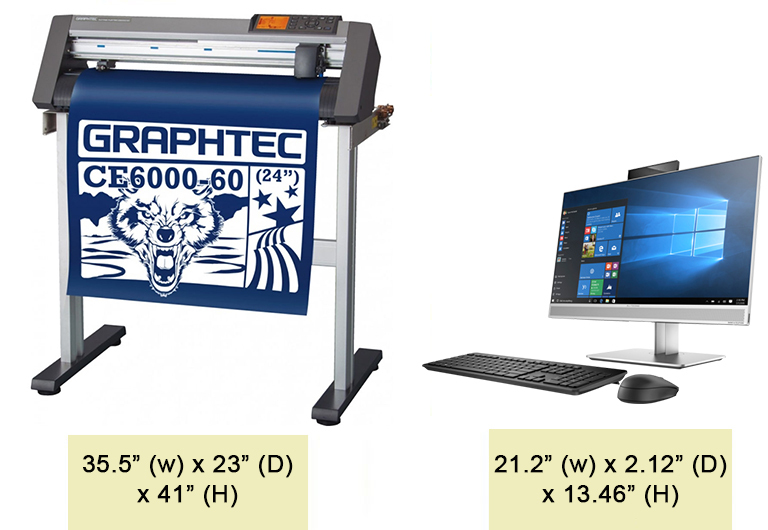 An open floor space of 5′ feet wide and 4’ deep (for the vinyl cutter which comes mounted on a stand) should be next to an 8′ x 3′ table which will hold the computer and the two printers. The open floor space needs to be bigger than the vinyl cutter so you can get to the back of the machine to load the rolls of vinyl.